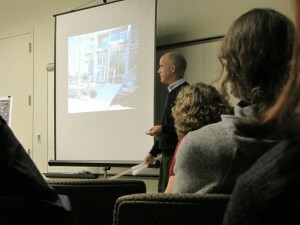 Clayton Smith shows an example of a courtyard from another Pacific Housing NW project. Photo by Wendi. A couple dozen community members attended the Early Design Guidance meeting held last night to discuss the proposed development on part of the Beacon Hill Station block. Representatives from Pacific Housing NW (who, previously, were involved in the Beacon Hill Central Park proposal) presented preliminary ideas for the building to the Southeast Design Review Board as well as to the community members in attendance. It is very early in the process, so all the designs shown were nowhere close to a final form. (The designs are currently not available online, but should appear on the DPD website soon. I’ll post a link then.) Several options were presented, including 40′ buildings and 65′ buildings, depending on whether the rezone currently in process goes through or not. All the options had a few things in common: an entrance to a 14-17 space parking garage via the alley, a courtyard to the north of the building, and some commercial space on the southwest corner of the building. The options varied in height, the presence of live-work space, and the configuration of entrances and setbacks. A 40′ building would probably have 30 units, and a 65′ building would have 45. Pacific stated that their goal is “sustainable principles”; they hope to include solar cells and possibly even wind power generators on the roof. They intend to plant large trees in the planting strips around the building. Materials Pacific said they may use for the building include “some lap siding,” masonry, concrete, and some paneling for upper levels. (Several community members expressed a strong dislike for panel-type siding during the public commentary period.) “Green walls” would probably be included as well. Parking would be below-grade, with a small 14-17 space garage. Parking is not required at all within the station overlay area, so there is no requirement to have spaces for each unit. The amount of commercial space in the building, as presented by Pacific last night, is very small—one small unit in the southwest corner. This was the most frequent concern mentioned by commenters during the public comment period. Neighbors who spoke up about it were unanimous in wanting more retail/commercial space in the building, preferably along the entire McClellan frontage. The current proposal “is not lively,” said neighbor Judith Edwards. Some commenters also expressed concern about setbacks. The designs showed setbacks above the fourth floor. Judith Edwards commented that, according to neighborhood design guidelines, setbacks are supposed to start above the second floor. She concluded, “We are going to hold firm on this.” However, this was not a unanimously-held opinion. Another neighbor commented that setbacks are unnecessary for this building because it will have plenty of visual interest already. In general, however, the commenters seemed fairly supportive of the development. After discussion, the Design Review Board members recommended “significant modulation” and an increase in commercial space. Setbacks will be required if the building is 65′ tall. 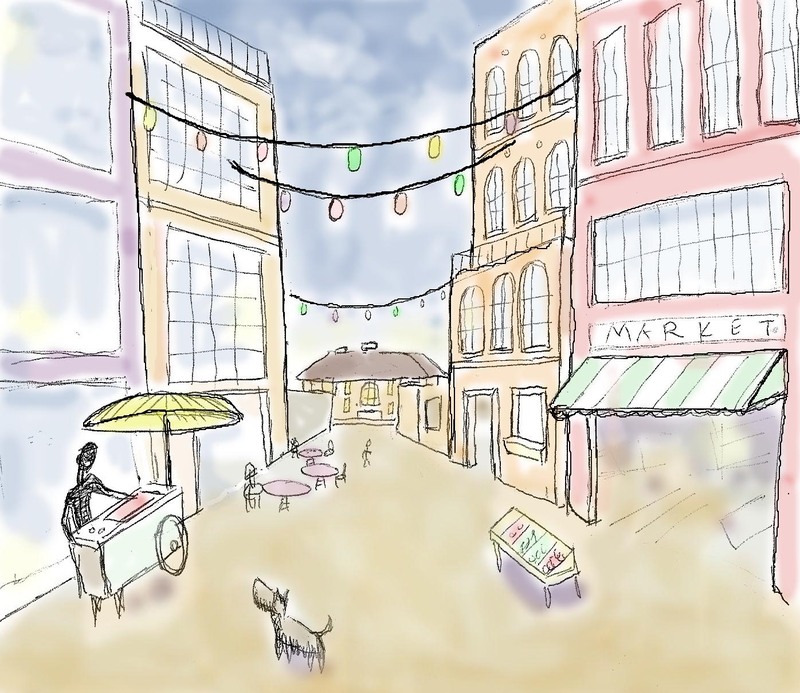 The designers should draw on existing structures in the neighborhood for materials influence. They must enhance the alley, activating it for pedestrian use. There will be another meeting in the future, after new designs have been created to address these issues. Stay tuned for the rest of the process.